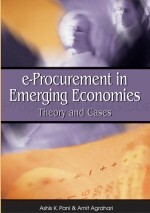 In this chapter, the concept of e-government procurement (e-GP), as it is being implemented in India, is explained. Furthermore, a set of six challenges encountered during implementation of e-procurement is discussed in depth. The six challenges discussed in the chapter are: lack of skilled personnel; multi-departmental implementation; inadequate IT and networking infrastructure; challenges in implementation of state-wide system; the need to regulate e-procurement market; and replicating best practices in federal state setup. A practitioner’s perspective is adopted to write this chapter. While this chapter deals specifically with e-GP in India, certain aspects of it can be generalized to e-GP implementations elsewhere in the world. Such generalization is possible since government procurement is driven by the same set of principles such as efficiency and transparency.